With 15 minutes before the start of class, a student scrambles to open his Chromebook and immediately jumps onto his Sparknotes bookmark. As the clock continues to tick, his eyes skim faster and faster across the screen, trying to cram everything written into his head. Suddenly, the dreaded sound of the ringing bell. He anxiously steps into the classroom with a lump in his throat, praying that Sparknotes won’t let him down. Sophomore Sarah Groose is one of numerous students at South who use online resources, such as Shmoop and Sparknotes to help her in class. According to Groose, she uses Sparknotes for English because it helps her navigate through more complicated texts, such as those written by Shakespeare. According to junior Drew Feldstein, another student at South who uses Sparknotes, he believes that using these online resources responsibly does not violate the rules of academic dishonesty at South. Although Feldstein views using Sparknotes as acceptable as long as the individual uses them appropriately, he also believes that the permission for using Sparknotes or any other online resource ultimately depends on the teacher and their rules. Similar to Feldstein, freshman Kevin Meier agrees that Sparknotes should not be used as a substitute for reading the real texts assigned in class. According to Meier, the online resource should be utilized for more pointed and specific reasons. 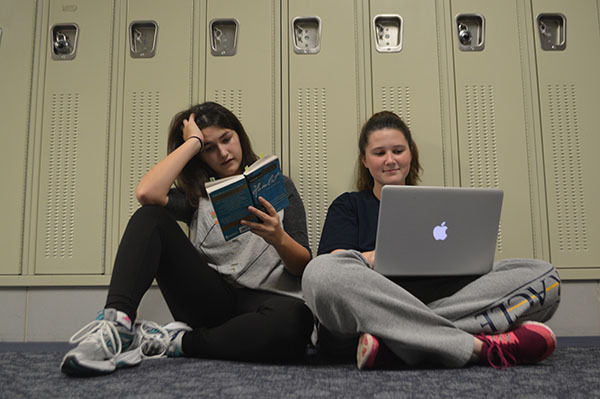 Despite these online resources having helped students such as Groose and Feldstein in their classes, senior Isabel Spingola says she isn’t a fan. According to Spingola, she chooses not to use Sparknotes because she believes it’s too drawn-out in detail. Along with Spingola, English teacher Robert Wysocki says that he doesn’t want his students to use these online resources in his class. However, Wysocki does support a part of Shmoop known as College 101, which is designed to help students going into college. On the other hand, English teacher John Allen has a different viewpoint. According to Allen, he opposes these online resources and believes that using such websites detracts from his students’ learning. According to Allen, online resources take away the beauty of learning through experience. He thinks that when a student turns to Sparknotes, the translated version conveys a lackluster interpretation of the art of storytelling, and the student is at a disadvantage because the writing has lost its style.